When piecing a quilt it is a truth universally acknowledged that all seam allowances must be exactly, precisely, and perfectly one-quarter-inch. Seamlines don’t match up on your quilt top. You can never get triangles to sew together correctly. If you’re having trouble with your quilt blocks not turning out in the right size it may have something to do with your seam allowance. Instead of a perfect 1/4″ seam allowance, what you really need is a scant 1/4″ seam allowance. The first time I heard the term scant 1/4″ I thought, “What! I have a 1/4” foot, what the heck is a scant 1/4″ seam? Then, I promptly ignored this information and started making quilts using things like an accurate 1/4″ foot and following the seam guide on my machine. Sounds reasonable. Well, it turns out that I experienced trouble with consistent block sizes because I have a problem on one of my machines. The needle drops slightly further to the left and creates a greater distance between my needle and the edge of my 1/4″ foot. In order to get an accurate scant 1/4″ seam allowance, I would need to know the exact location of a quarter-inch from my needle. What is a Scant 1/4″ Seam Allowance and Why is it so Important? It turns out that pressing your seam allowance to one side shrinks the seam the width of the top and bottom thread. The more seams in a block, the more shrinkage. The problem continues to develop as you start assembling blocks across a quilt top. Before you know it, the individual quilt blocks have shrunk, affecting the entire quilt top size. What you need is a seam allowance that allows for this tiny amount of shrinkage. While a thread’s width doesn’t sound like much, it adds up quickly and that is why you need to use a scant 1/4″ seam allowance to create consistent seams so your blocks will line up. First of all, before we can begin to chat about using a quarter-inch foot or achieving a scant 1/4″ seam allowance we first need to discuss thread and why it matters. With quilting, the weight and consistency of thread create a very slight issue because the thread is taking up a bit of fabric space in the seam. Using a finely spun brand such as Aurifil helps reduce some of the bulk that naturally occurs when piecing. Combining a finely spun thread with a scant 1/4″ seam ensures that you get a perfect 1/4″ seams and no loss of fabric space every time. Finding a scant 1/4″ seam allowance is easy. Once you’ve located a scant 1/4″ seam on your machine, scroll down to find a way to mark this seam allowance. Place a quilter’s ruler under the presser foot and slowly lower the needle until it is a thread’s width to the right of the 1/4″ mark on the ruler. In front of the feed dogs, mark the bed of your machine with one of the methods below. Or try this method. Using the far-right edge of a piece of 1/4″ graph paper, place the graph paper under the presser foot and slowly lower the needle until it is to the right of the 1/4″ line. In front of the feed dogs, mark the bed of your machine with one of the methods below. 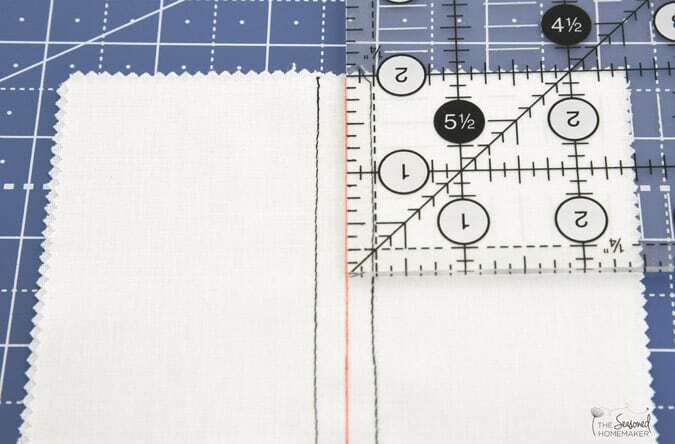 My preferred method is to use a seam gauge (see below) to perfectly line up a scant 1/4″ seam allowance. 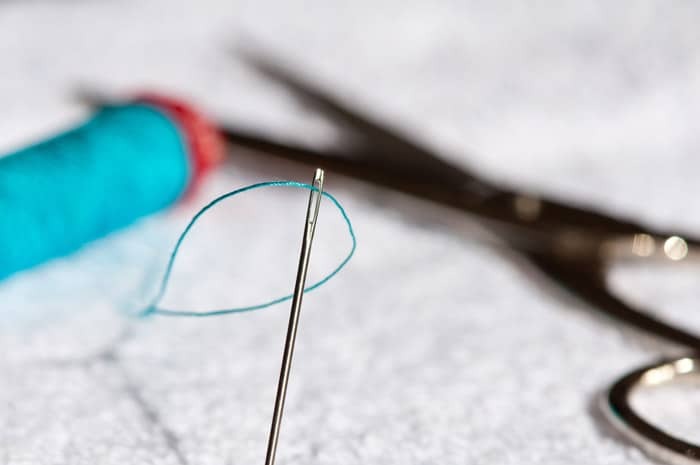 Place the template under the needle and drop the needle through the tiny hole giving the exact location of a scant 1/4″ seam allowance. Once the location is determined, use one of the methods above to create a seam guide. Below are affiliate links to several of these seam gauges. I use the Ideal Seam Gauge by Sew Very Smooth, but the others are equally accurate. 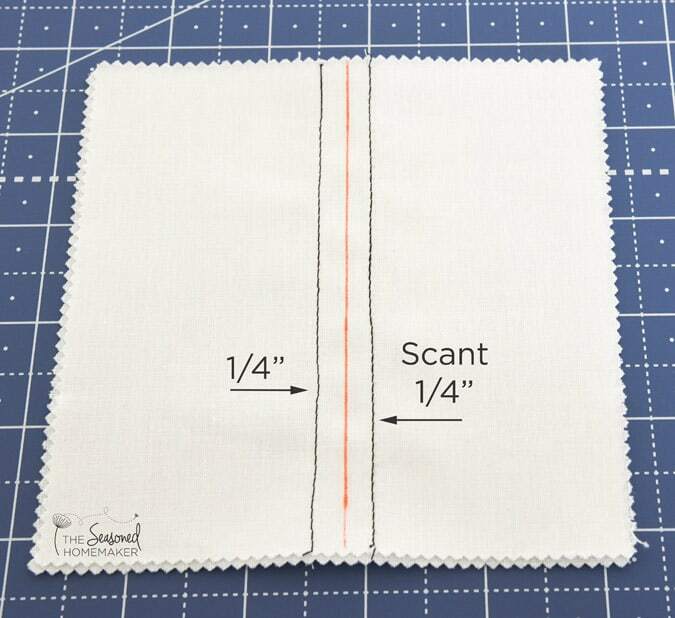 Now that you know where your scant 1/4″ seam allowance is located, you will need to somehow create a guide. Below are a few ideas that I have tried with some success. Use blue painter’s tape and make a stack with 2-3 layers. This will create a guide for the fabric. Mark a line on your sewing machine bed with a fine point Sharpie. Whichever method you choose will work as long as you place the guide in front of the feed dogs. 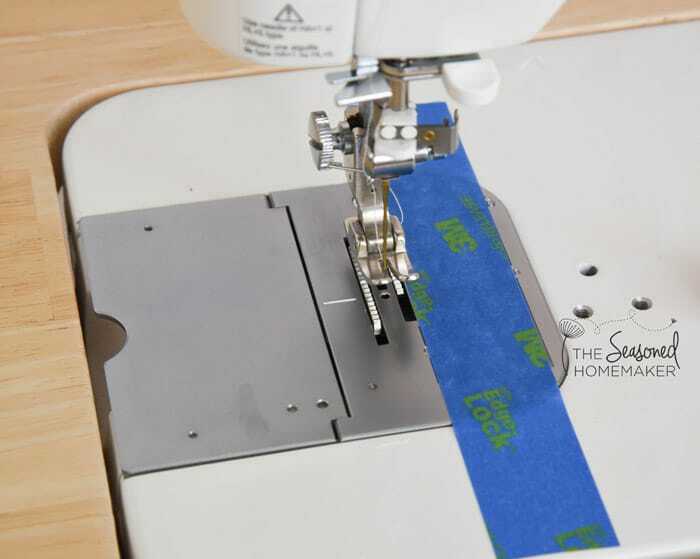 This prevents the seam guide from interfering with the feed dogs when you’re sewing. Now that you’ve created a scant 1/4″ seam allowance on your machine you will need a way to test it. Use a 5″ square of white fabric and mark a red line down the center. Sew a 1/4″ seam on one side and a scant 1/4″ on the other to demonstrate the difference. It’s very subtle, but there is definitely a difference. I recommend doing a seam allowance test. 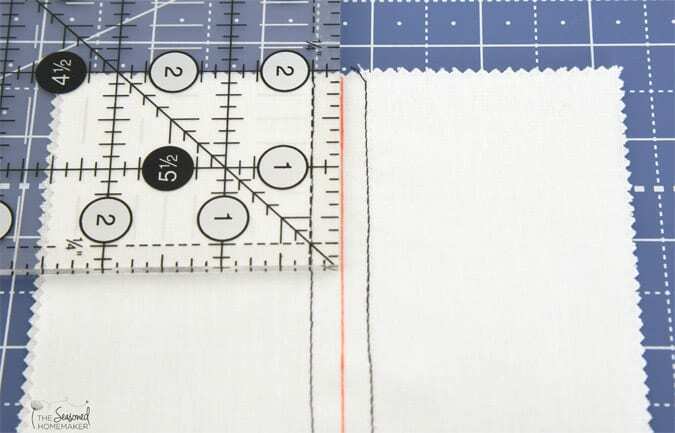 The image below shows an accurate 1/4″ seam allowance. Notice that it is right on the mark. As a result of piecing with this full 1/4″ seam allowance, you could lose a little fabric in the overall block size. I recently had this happen to me when I was piecing a challenge block for my quilt guild. I used a full 1/4″ seam allowance and the completed block was off by almost 1″. Knowing that someone else would likely end up using this block in a quilt, I was not sure what to do. For a moment I considered ripping out all of my seams and starting over. In the end, I was able to salvage the block by wetting and blocking it. This stretched it out to the correct size, but it was very close. But, I never want this to happen again! Notice the subtle difference in the scant 1/4″ seam allowance below. As a result, this tiny fragment of space allows for the shrinkage that occurs because of thread width and pressing. If you have a sewing machine with an adjustable needle position, this can be a great way to get a consistent scant 1/4″ seam allowance. Test out several methods to determine what works best for you. 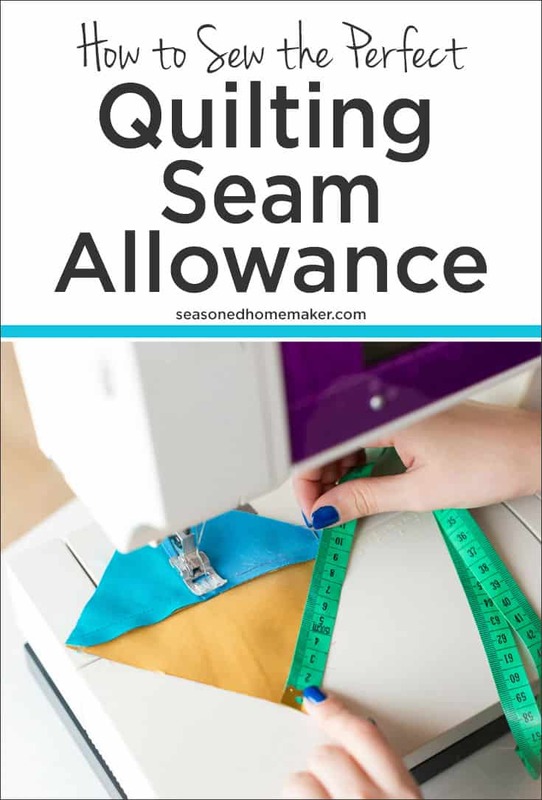 Take the time and determine your best method for achieving the perfect 1/4″ quilting seam allowance. Suddenly you’ll feel confident enough to tackle difficult blocks. And that makes the possibilities endless!